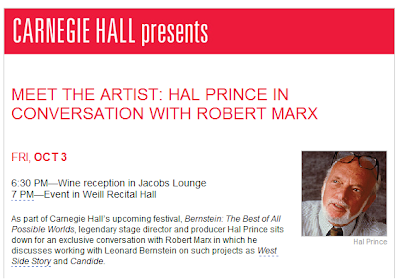 Showing no residual signs of the minor stroke he suffered earlier this year, Hal Prince was spry, funny, warm, passionate and wonderful in his talk about his career in relation to Leonard Bernstein. The season opening at Carnegie Hall kicked off celebrations around the city in honor of what would be Bernstein's 90th birthday. Hal first encountered Bernstein when Hal would travel to New York to see the original production On the Town, which he saw around 8 times between 1944 and 1946. He had planned to concentrate on serious drama before seeing this show but he changed his mind - as they say, the rest is history. He came to New York after graduation and got a job with George Abbot . The Korean War called him away for two years and when he came back, he went to see Mr. Abbot who said, "Back so soon?" Mr. Abbot gave him a job at Wonderful Town. He was actually an understudy and third assistant stage manager. He previous assistant stage managed on Tickets, Please! and Call Me Madam! At Wonderful Town, which Bernstein wrote, he worked his way up to stage manager, eventually leaving to work on The Pajama Game. When Hal was out of town working on A New Girl in Town, he called his good friend Stephen Sondheim. Sondheim told him that they had lost their producer for West Side Story. Hal asked if he and his producing partner could meet with the West Side team - Bernstein, Sondheim, Arthur Laurents and Jerome Robbins. Sondheim told him that "Lenny" would want to play it for him. Sondheim had already played it for him, but that would have to be a secret because Lenny's rule was that nobody could hear it. So they met at Bernstein's apartment at the Osborne on Central Park West. About half way through the score, Hal started singing. Lenny stopped playing and exclaimed, "What I've always wanted - a musical producer!" West Side Story won virtually no awards but was a huge hit. Hal said he stood in the back and knew they had something very special. He said the movie made them all rich, but none of them liked it. He didn't mention the upcoming revival except to say that the original production cost in the neighborhood of $300,000 to produce while the revival is somewhere around $12 million. He also spoke of his 1973 revival of Candide . The original production was a flop - Bernstein's ebullient score didn't gel with Lillian Hellman's darkly political book. He did it with Hugh Wheeler writing a new book based more on Voltaire's original work. They got Hellman's permission to do so but on the condition that not a single line of her work would be used. He directed it first at BAM with a tiny cast and orchestra, the latter which was to Bernstein's chagrin. But it worked. The production was expanded for New York City Opera, at Beverly Sills insistence (Hal said nobody ever said 'no' to Beverly) and to Lenny's pleasure, the orchestra and orchestrations were restored. It also played on Broadway for 740 performances at the Broadway Theatre and garnered a Best Directing Tony for Hal along with a Best Book Tony for Hugh, among others. Hal has 21 Tony Awards, however he said that his experience with West Side Story, which won virtually nothing, taught him the value of awards. He spoke a little more about Bernstein and the fact that there was never and may never be another like him. Just don't drink too much at the wine reception. You need to be lucid!!! I say drink aplenty. Cheers! Go celebrate! At least it might have received a cast album. How cool! I'm so glad I found your blog so I can live vicariously through you! You are one lucky NYC girl.